The phosphorescent face provides a background glow to assist in low light conditions. The glow lasts over 2 hours in complete darkness, and is perfect for either night jumps or those sunset loads when it starts to get dark. The Glow Face Altimaster Galaxy now features a field replaceable lens. In case your lens gets scratched or cracked you will now be able to replace it yourself instead of having to send it to get serviced. 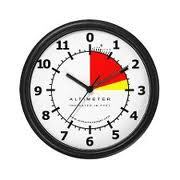 The 2" dial face features larger, easier to read, numbers. 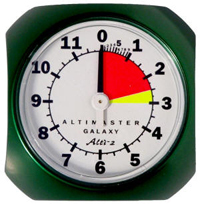 The Glow Face Altimaster Galaxy has a robust aluminum casing and has an altitude range of 18,000 feet MSL, marked in 250 foot increments. It contains a durable mechanism made from temperature compensating metals for minimal friction and precision accuracy. The face of the galaxy is highlighted with yellow caution and red warning arc that starts at 3,000 feet. The galaxy glow face contains a durable mechanism made from temperature compensating metals for minimal friction and precision accuracy. Comes with hand mount.